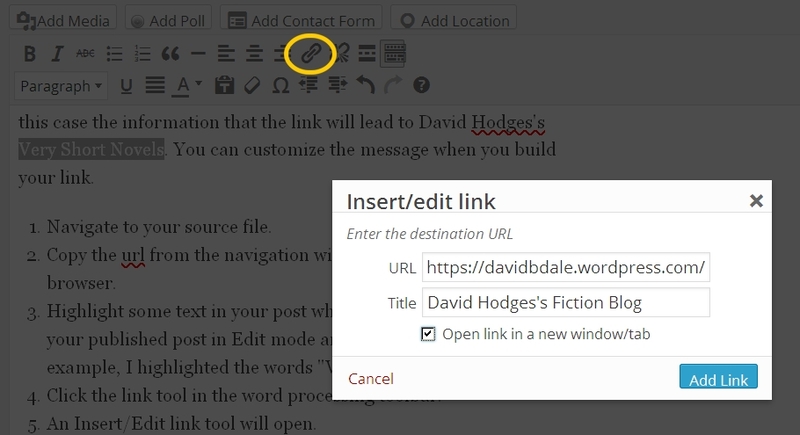 When citing sources in your posts, you’ll want to provide convenient hyperlinks so readers can navigate directly to your support material without losing their place in your essay. Here is an example of a link to a website called Very Short Novels. Notice that if you hover over the link, an explanation will appear, in this case the information that the link will lead to David Hodges’s Fiction Blog. You can customize the message when you build your link. Navigate to your source file. Click the link tool in the word processing toolbar (circled in yellow). An Insert/Edit link dialogue will open. Paste the url you copied into the URL field (be careful not to end up with http:// twice). Write descriptive copy in the Title field. The red circle outlines a toggle called the Toolbar Toggle. Click it to reveal an additional row of editing tools including the formatting drop-down, indent tools, and text color selector. The toggle reacts to repeated clicks by hiding and unhiding the second row of editing tools. 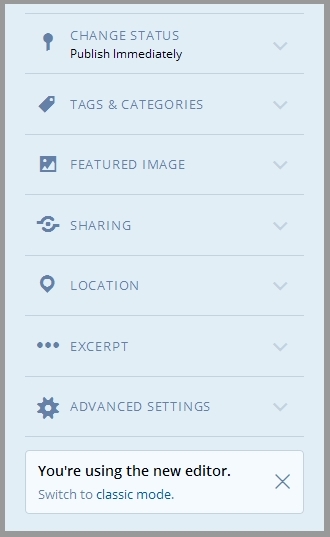 I don’t see the value of the new WordPress edit mode and prefer the “classic mode” primarily because it makes choosing categories so much easier. When it appears on your page at all, the toggle back to “classic mode” appears at the bottom of the right sidebar.